The GODAE OceanView Science Team (GOVST) continues to provide coordination and leadership in consolidating and improving global & regional ocean analysis and forecasting systems on an international level. The GOVST aims to encourage international collaboration to address the scientific and technical challenges associated with operational oceanography. The role of GOVST is to foster research that will lead to the enhancement of existing systems and the development of next generation systems. The GOVST is linked to JCOMM, but has a free remit to investigate a wide range of scientific and technical issues. In parallel, it demands international collaboration and coordination to establish standardization of products and interoperability between operational systems. 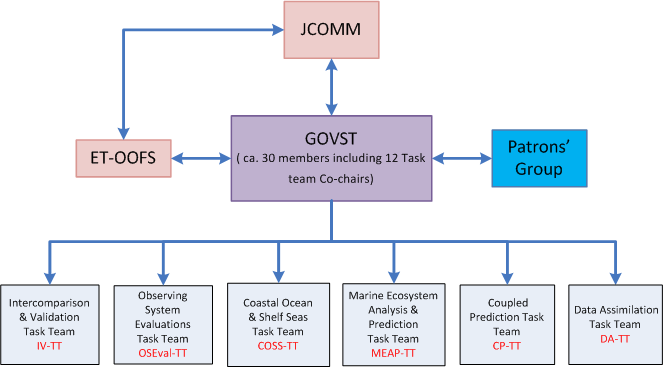 The new Expert Team on Operational Oceanographic Forecasting Systems (ET-OOFS) under the Joint WMO/IOC technical Commission, JCOMM, has recently been established for this purpose. ET-OOFS has an intergovernmental mandate through JCOMM to provide coordination of activities at operational agencies to deliver consistent ocean forecasting and related services that positively impact their users. The role of ET-OOFS is to foster international cooperation that will lead to improved services from, and usability of, existing and planned operational ocean forecasting systems. ET-OOFS operates within the formal JCOMM process and its decision must reflect the consensus within the international community. Together these two groups provide oversight of the development and operation of ocean forecasting system. The two groups are complementary and mutually dependent. GOVST will be required to provide recommendations to ET-OOFS on which elements of the science and technology are sufficiently mature for operational adoption. ET-OOFS will be required to refer scientific and technical issues that have high impact on the operational systems to GOVST for further investigation and advice. For more detailed information about GODE OceanView aims and objectives, please refer to the GODAE OceanView Terms of Reference. The Global Ocean Data Assimilation Experiment (GODAE), initiated in 1997, aimed to establish an effective and efficient infrastructure for global operational oceanography and to develop practical and robust operational activities for oceanography with great benefit for society. The International GODAE Steering Team (IGST) coordinated and facilitated the development of global and regional ocean forecasting systems from 1998 – 2008. Many challenges still remain as global operational oceanography now needs to transition from a demonstration to a permanent and sustained capability.